Four years ago, if you had have told Grace Hinzano and Everlyne Kahindi that they would graduate from University with a BA in Education, there wouldn’t have been the remotest chance they’d believed you. Both girls were raised in rural regions of Kenya known for extreme poverty and for families with multiple siblings, where girls are generally not supported to pursue education. Grace and Everlyne persevered through personal hardships incomparable to North American standards that included cooking, washing clothes, caring for younger children and fetching water for long distances everyday – from the age of seven! But still they pushed hard to be allowed to attend school and studied whenever they could spare time from their chores. Grace’s father didn’t feel girls were worth investing in and would not pay for her to sit for the Kenyan exams that would provide a secondary school certificate. At the eleventh hour an uncle sympathetic to her intense determination paid the fee for her. Everylne became pregnant in her grad year. Her shock and disappointment combined with the ridicule she suffered form her peers almost caused her to drop out, but her teachers encouraged her to sit the exams at 7 months pregnant. Grace achieved one of the top scores in her class while Everlyne emerged 2nd best. They accomplished this without ever anticipating that they could take their education further. But in the same year, Lotte Davis, the founder of One Girl Can who had been building classrooms and a library at Ganze Girls School where the girls attended, had begun to explore a scholarship program. She found it a waste that the brightest girls in these schools might never get a chance to develop professional careers and start to impact the gender imbalance that effects women in Africa. 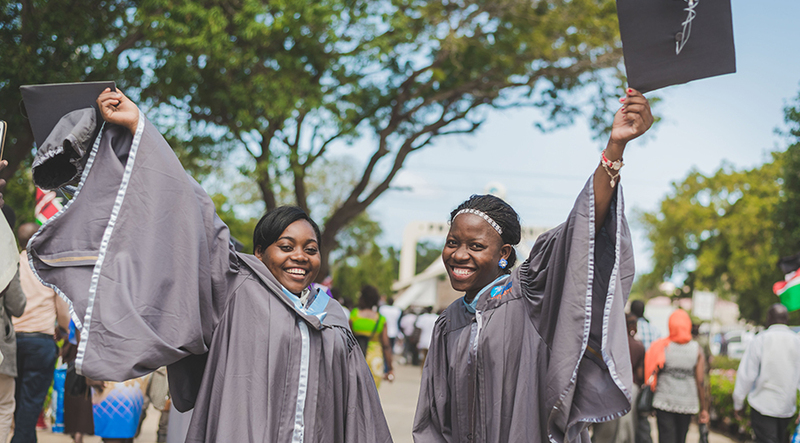 Grace and Everlyne earned the first two scholarships that Lotte established and now four years later, she proudly attends their graduation ceremony at Pwani University with tears in her eyes. “I couldn’t be more more proud if they were my own daughters”, Lotte said. “And today we have 31 more girls who will follow in their footsteps over the next few years”. With plans to have over 500 girls in university by 2025, all tracking towards meaningful careers, attitudes towards the potential that girls in Africa will have is bound to start changing. It felt like yesterday that our girls were just entering university through our One Girl Can scholarship. Today, we’re so proud and excited to share our first university graduates’ stories and success. Grace Hinzano and Everlyne Kahindi both persevered through personal hardship to excel in their studies at both Ganze Girls’ Secondary School and in their respective university programs. When Grace sat for her Kenya Certificate of Secondary Education at the newly established Ganze Girls’ Secondary School, little did she think she would achieve one of the top scores in her class. This was by no means a small feat given her difficult upbringing and complex family background (her father didn’t believe in education for girls). Born into an extremely poor family, Grace is the eldest of five children. Her father is a carpenter in the coastal town of Malindi and her mother is a small-scale peasant farmer. Since seven years old, she’s had to cook, wash clothes and bathe her younger sisters and brothers and fetch water from the river. She barely had time for her studies and as the years went by her performance steadily dropped. But Grace pushed through the difficulties, as she was determined to succeed. With help from a sympathetic uncle who admired her tenacity, Grace enrolled in Ganze Secondary School to re-sit her Form Four examinations. Her uncle paid the fees that her father refused to. Grace passed her exams, which qualified her to proceed to university. Grace is now a proud Bachelor of Education graduate from Pwani University, with a bright future as a teacher who is dedicated in helping more young girls like her succeed an education. Everlyne, was born into a family of 16 children in the small town of Ganze in northeastern Kenya, a place both remote and extremely poor. Her mother believed in the value of education for her girls as well as her boys, and when Ganze Secondary Girls School first opened its doors, she was determined that Everlyne would go. But with the family finances being so inconsistent, there were many months when Everlyne could not attend school. At 19, Everlyne became pregnant on the homestretch of her secondary schooling. The shock and disappoint to herself, her teachers and parents was overwhelming and she often thought about dropping out. But her teachers rallied behind her, encouraging her not to give up, and was allowed to remain in school in order to sit for her final examinations. “The girls often gossiped about me and poked fun at me, embarrassing me even more,” says Everlyne. Dejected, Everlyne pressed on studying. At seven months pregnant, Everlyne sat for her Kenya Certificate of Secondary Education examination and emerged second best in her class earning her a full scholarship and accommodations to study at university. Everlyne later delivered a baby girl who inspires her and fills her with determination to continue on. Everlyne, is also a proud Bachelor of Education graduate from Pwani University.